With the integrated GPS receiver the Link-9 now has four ways to ensure you have a GPS fix in the event of an emergency. 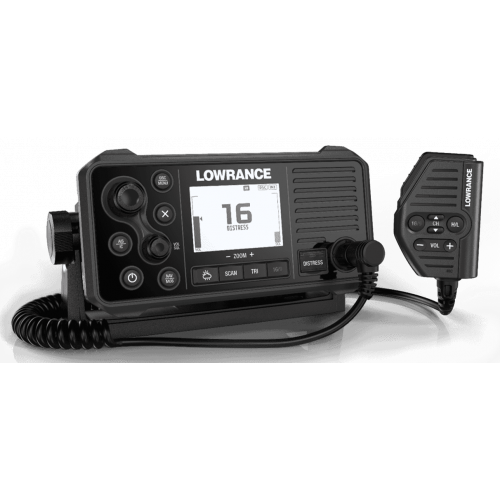 AIS information can be viewed on the Link-9’s built-in screen, or overlaid on your chart or radar screen through a compatible multifunction display. The Link-9’s removable fist mic can be connected to the front or rear of the radio, and optional extension cable allows the radio and mic to be mounted separately. For example, the Link-9 can be mounted overhead, with no hanging cables, while the mic is connected to an extension socket on the dash below. Link-9 features easily removable top and bottom bezels which reveal mounting holes allowing the same style of mounting from the front that is featured on Lowrance MFDs. Press the NAV button on the Link-9 to turn it into a navigational instrument displaying your Speed and Course. V60 also contains a Man Overboard (MOB) function, hold down the NAV/MOB button to drop a waypoint on your current location and the Link-9 will enter MOB mode to show you how far away you are and where you need to steer to get back to the position of the MOB event.